WHICH ROOM WILL THE TV BE WALL MOUNTED IN TO? If the TV will be wall mounted, will it be mounted higher than normal for example above a fireplace, will we need to tilt it down? Even if it will be mounted at normal height a tilting bracket is a better option to use anyway as hiding all the cable will be make easier. 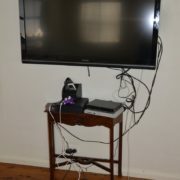 Another type of bracket we could use is a flat panel bracket, the advantage of using a flat bracket is the screen can sit a lot closer to the wall, but makes hiding the cables harder and if you wanted a power point behind the TV, this will pretty much be impossible to do, but we do not always need a power point behind a TV as the cables can be hidden away. Is the room an odd shape or the room not square to the screen? This is where a pivoting arm bracket comes into play, the only limitation is on a steel framed house. 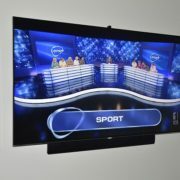 As the TV will be sitting away from the wall, there will be more weight on the arm and because the frame is not very thick (only a few millimetres), you run the risk of the bracket coming off the wall, we would not recommend wall mounting a TV any larger than a 37” on a pivoting arm bracket for this very reason. Will the screen be mounted in the corner of the room? Although this is not ideal as there will be a lot of wasted space, we can wall mount a TV in a corner of a room, with a special corner bracket that is specially designed for that job, size doesn’t matter to the bracket but we are limited because of the length of the arm. Pivoting arm brackets are also available as electronic, so no need to pull the screen out yourself, just grab the remote and bracket will move out on its own. 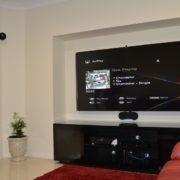 WHERE CAN I GET A TV WALL BRACKET FROM? Now the million dollar question, where can I get a bracket from? Although this is an easy question to answer, any TV retail store will be more than happy to sell you one, but they have a bad habit of charging you your entire savings for a simple bracket. All these examples are form various Australian retail stores, and to compare just go to our wall bracket page for prices. If you have any questions about wall brackets or looking to wall mount your TV, give us a call, were more than happy to quote a TV bracket for you if you wish to mount it yourself, or if you don’t feel confident we’re more than happy to complete the job for you. Please note that the screen shots were taken from various Australian major retail outlets. TV wall brackets, what's available and what's right for me?